Trigger finger is a common problem in the hand that causes locking and pain in the involved finger or thumb. The technical name used to describe trigger finger is stenosing tenosynovitis. Stenosing means a narrowing of a tunnel or tube-like structure (the sheath of the tendon). Tenosynovitis means inflammation of the tendon. Your fingers flex (make a fist) and extend (straighten out). Two sets of tendons make this possible – flexor tendons (on the palm side) and extensor tendons (on the back side of the hand). 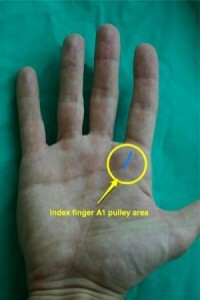 Trigger finger involves the flexor tendons of the hand. Flexor tendons are normally smooth, white bands of tissue that start as muscles in the forearm and connect to the bones in your fingers. As they go from the forearm into the wrist and fingers, they pass through tight tunnels (sheaths) that keep them close to the bones of your hand. The sheath is lined with a lubricating tissue called synovium. This tissue sits between the tunnel wall and the tendon. 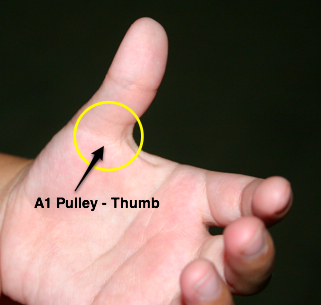 Trigger finger is caused by inflammation of the synovium, enlargement of the tendon, and thickening or narrowing of the sheath itself, usually in the area of the palm closest to the fingers. The name of the tendon sheath in this area is the “A1 pulley”. These problems with the tendon’s lining, the tendon, and the sheath, all combine to make it hard for the tendon to glide smoothly through the tunnel as your finger bends and straightens. 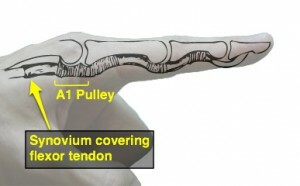 As the patient tries to flex (bend into a fist) the affected finger, the enlarged tendon has trouble passing underneath the sheath’s tight opening. 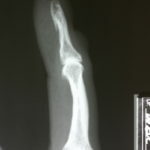 When the patient grips tight enough, the swollen tendon is suddenly pulled through the sheath with a painful snap, which may lock the finger in a bent position (it won’t straighten except with help from the other hand). 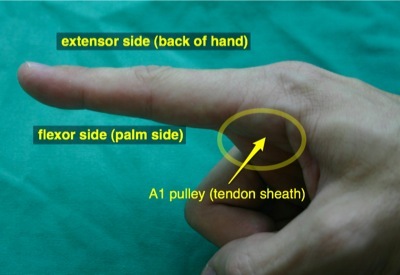 The action of straightening the finger from its locked position creates another often painful snapping sensation as the enlarged tendon passes back through the tunnel. In this video, one of my patients demonstrates how her finger catches and triggers as she straightens the finger out from a flexed (in a fist) position. The cause of trigger finger cannot be known for sure in all cases. Work or hobby activities that involve repetitive gripping or holding tools strongly for long periods of time may strain the tendons and cause swelling and irritation of the tendon synovium (lining) or the tendons themselves. Some patients with other medical problems like diabetes, rheumatoid arthritis, or gout may develop trigger fingers more frequently than the average person. Pain in the area of the inflamed tendon lining or sheath may be the first sign of trigger finger. Sometimes the pain may shoot or extend into the finger on the top side (back side of the hand), but is usually focused on the palm side at the base of the finger or thumb. Painful locking or snapping of the finger is the next stage of symptoms that most patients experience. This is often worse in the morning but may be worse at the end of the work day. When symptoms have been going on for several months, the locking may stop, but patients may be left with a stiff finger that does not bend or straighten like it used to. The pain may or may not subside as the locking stops. Non-surgical treatment is a good first step in treating trigger finger. Surgery may be a reasonable first step if the finger is locked in a painful, stiff position and cannot be “unstuck” by the patient without extreme pain. This is unusual. 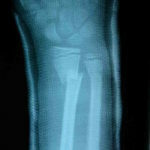 The first step in treatment is to avoid or decrease the activity that seems to aggravate the locking and pain. Warm water soaks, anti-inflammatory medicines, and over-the-counter rubs and creams may help with the symptoms of trigger finger. A steroid injection may also be recommended. The injection places a small amount of anti-inflammatory cortisone directly where the problem is – in the tendon sheath. This reduces swelling and inflammation in the tendon sheath and may cure the problem forever. Success rates with injections are close to 60% in most cases. Surgery may be appropriate when these non-surgical treatments fail to cure the problem. I usually recommend no more than two steroid injections in the same finger, but this rule is not absolute. Trigger finger surgery is outpatient surgery. It is done under local anesthetic, with or without sedation. An incision is made in the palm of the hand at the base of the finger or thumb. The surgeon cuts the swollen, tight tendon sheath at this level, and this frees up the tendon to glide smoothly through the finger. After surgery a small dressing is placed on the hand to protect the incision but allow flexibility and motion for the fingers. In most cases the dressing can be removed in five days and the patient may lightly use all the fingers the day after surgery. If there are sutures on the outside of the skin, they are removed in 10 to 14 days. I was greatly pleased with Dr. Henley’s concern for my comfort and ease of mind. He told me exactly what would happen and it did . Recovery was swift and relatively painless. I think I took one pain pill throughout the whole process. I was especially pleased with his post surgery adios . He said goodbye and don’t come back! I took that as a hope that I wouldn’t have any more problems. A great big thank you Doctor. I have had two issues (growing old is wonderful) that I have seen Dr. Henley on over the last few years (Trigger Finger & Tennis Elbow). Both of these issues were diagnosed and treated by Dr. Henley in a very professional non- surgical manner.Bottom line is that, in my opinion, Dr. Henley is a doctor who can be trusted. His treatment recommendations for me have been effective. If there is any time in the future that surgery would be recommended, I would not hesitate to trust the recommendation.In addition, the office staff also rates high marks as they are very professional and friendly. I would recommend Dr. Henley to others for this type of surgery. I didn’t have to wait long for my appointments to see him, was in and out on time, which is important to me. Everyone at the Eye Center Surgery Center was very nice, helpful and explained what was being done with each step. One thing that happened before the surgery was a telephone call and the pre-surgery information was taken then, not at the facility, I was a lot more comfortable answering their questions about my past health history and it was much more private. I enjoyed visiting with the young man who called. The anesthesiologist Dr. Henley chose for me visited with me before the surgery and listened to what I had to tell him, I don’t require much medication to put be to sleep, I’m usually given too much, this wasn’t the case this time and I awoke easily after the procedure. My nurse that prepared me for surgery was great, he got the stick for the IV the first time and it was almost painless, he was very good at his job & seemed to enjoy his work. Dr. Henley explained what he would be doing during the surgery and was very calming in the pre-surgery visit. I appreciated the follow up call the next day to check on me, I had a couple of questions and they were easily answered during this call. My follow up visit was good and I was told not to come back unless I had problems, so that was a good thing. Staff at his office was friendly and courteous as well. I appreciated that surgery wasn’t the first thing Dr. Henley suggested, he first injected my finger and waited to see if surgery was needed. That was just a short fix,about 3 months, but it seems as if the surgery has fixed it. I’m still sore and have a little tingling, but it seems to be getting better, no more painful finger “lock ups”! As a retired surgical RN, I am super cautious and critique everything. Having my trigger thumb operated on by Dr. Henley was actually an easy very professional experience. Phil, the admitting RN, and the entire team, including Dr. Henley does their job extremely efficient, thorough, yet at the same time friendly and makes one feel at ease. Minimum time for the entire procedure. I highly recommend Dr. Henley.